Traditional way of generating knock out is limited by rare homologous recombination event, which occurs at extremely low frequency (one in million or less). It also requires lengthy and laborious construction of donor vector and complicated positive and negative selection. Due to the low frequency, it is almost impossible to generate knock-outs using somatic cells. Engineered nucleases (EN's) can facilitate targeted gene knock-outs by creating a single double-strand break in a sequence-specific manner. EN's bind a specific DNA sequence, and induce a double strand break (DSBs) at the bound site. In the absence of a homologous template, this break is repaired by an imperfect endogenous repair mechanism called non-homologous end joining (NHEJ). NHEJ often leads to frameshift by the addition and/or deletion of nucleotides (indel event), resulting the loss of gene function or a knock-out (KO). In the presence of homologous donor DNA at much lower efficiency, homologous recombination can occur, which can repair the double strand break by homology directed repair mechanism (HDR). This will replace the existing sequence with the ones in donor sequence, creating a knock-in (KI). Efficiency of EN's in knocking out gene can be as high as 80% in cells without the need for selection. EN's become remarkable tools to generate engineered cells and organisms that were simply impossible with traditional homologous recombination. Zinc-finger nucleases (ZFNs) are artificial sequence restriction enzymes. They are composed of a zinc finger DNA-binding domain and a DNA-cleavage domain (FokI). The DNA-binding domains of individual ZFNs typically contain between three and six individual zinc finger repeats that each can recognize between 9 and 18 basepairs. Zinc finger domains can be engineered to recognize specific DNA sequences then to modify a target sequences in a complex genome such as genetic deletions (knock out), duplications, inversions, and corrections. TALE, or TAL (transcription activator like) effectors, are transcription activators secreted by plant pathogen Xanthomonas. Each TALE module can recognize a single DNA base. Engineered TAL effectors can be fused to the cleavage domain of FokI nuclease to create sequence specific endonuclease (TALENs). 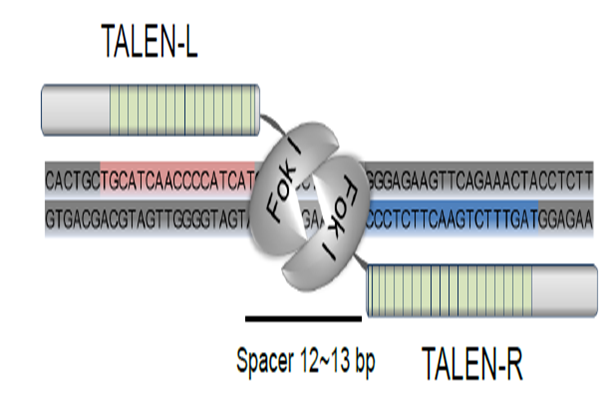 TALEN can function as a site-specific nuclease cleaving the target sequence in genome, which allows various types of genomic engineering such as gene knockout and gene knock-in. TALEN works as a heterodimer that generates cuts in the middle of spacer region. In our TALEN structure, each left and right arm recognizes 18~20 bp target sequence separated by 12~13 bp of spacer. RNA guided endonucleases adapted from CRISPR/Cas9 system that are novel, programmable genome engineering tool. 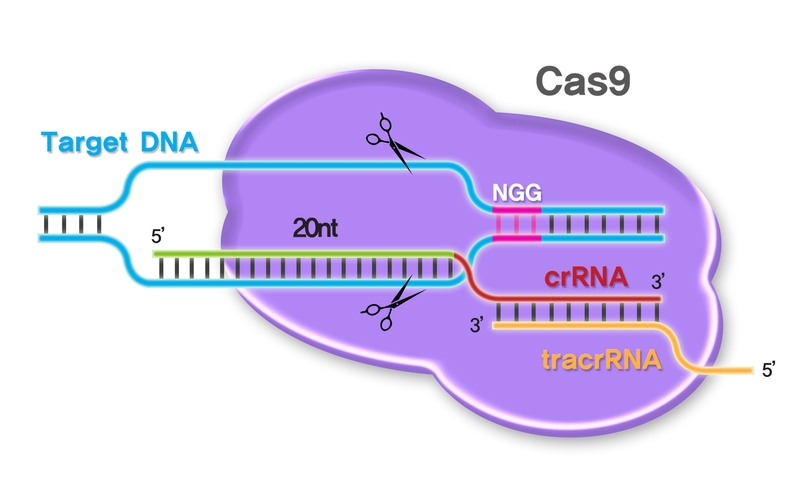 Cas9 forms a sequence-specific endonuclease when complexed with two types of RNA; target selection (CRISPR RNA or crRNA) and the constant component (transactivating crRNA or tracrRNA). 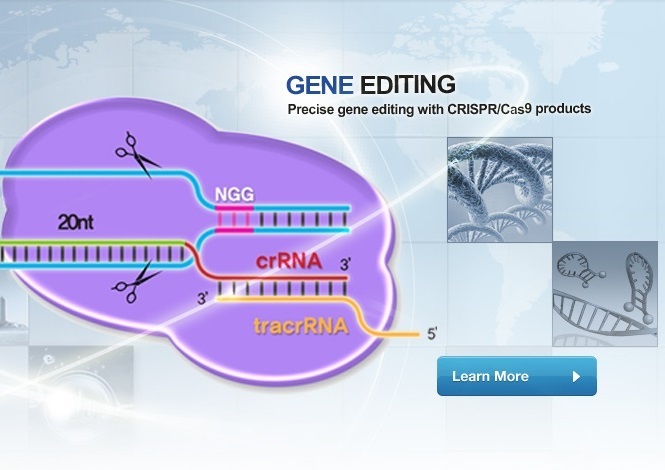 Since the target sequences requires 23 bp in length ending with GG at the end, crRNA can be designed to cleave pretty much any region of the genome. The efficiency of EN's to cause mutation in cells is 5~30% in most cases. Although this efficiency is quite remarkable compared to conventional gene targeting technologies, it still requires extensive screening. We have a patent pending knockout enrichment system that can simplify the screening process, the use of surrogate reporters. 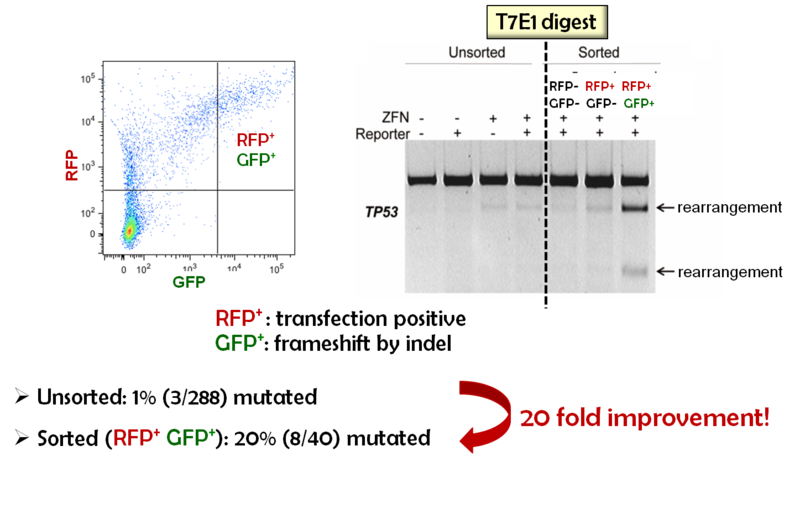 The surrogate reporters are composed of genes encoding two fluorescent proteins (RFP and GFP) linked by the EN target sequence. In the absence of EN expression, they are designed to express RFP but not GFP. 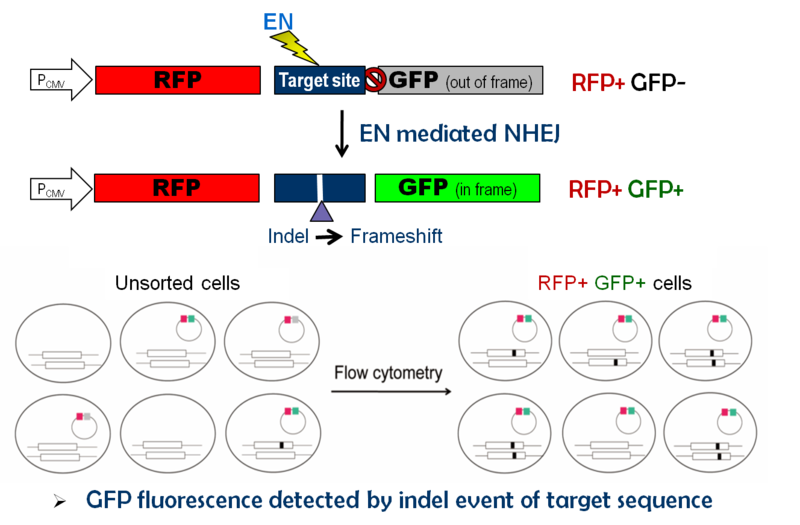 The activity of EN causes frameshift mutation in the GFP gene, resulting in gene expression. Screening for double positive cells allows quick and simple validation of the activity of various EN's and enrichment of cells with gene editing events. Now we also provide 2nd generation surrogate reporter vectors contains transmembrane protein H2-KK or hygromycin selection cassette in addition to GFP, which enables enrichment of cells with gene editing by magnetic cell sorting (MACS) or drug selection by hygromycin. Our surrogate reporter system is a wonderful tool to visualize and enrich the cells with gene editing event. Using surrogate reporter system, the frequency of finding the knock out cells can be improved by 3~20 fold.